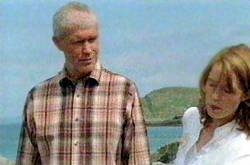 In Series 6 Episode 7 of Monarch of the Glen, Golly (Alexander Morton) and Meg (Karen Westwood) go on holiday to the west coast. Scenes filmed at Camusdarach Beach near Morar and elsewhere in the immediate area. From Fort William take the A830 to Arisaig. Continue for five miles until you pass the sign for Camusdarach camping site on the left side of the road. Just past this, there is a sign reading Car Park 100 yards. Pull into the carpark which is on the left hand side of the road at the bottom of the hill. From the car park follow the signed path to the beach along the small stream. The filming location was nearby the rocky outcrops at the other end of the beach from the path.